Armed with a set of instructions from her 13-year-old daughter, architectural designer Sharon Davis set to work on crafting an adolescent-friendly outbuilding on the family’s 30-acre property near Garrison, New York. "She wanted the tree house to be a place for playing and hanging out with friends. But she also wanted a contemplative space where she could write and be hidden from view of the adults," Davis explains. Davis spent a year looking for the right tree in the vicinity of the family’s country home—a 19th-century farmhouse that the designer has been slowly renovating since 1995—but she and her daughter had trouble finding one that met all their requirements. 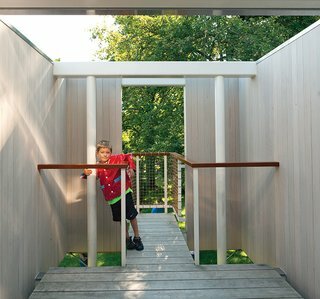 A 17-foot-tall freestanding play structure that designer Sharon Davis designed for her family in upstate New York can only be entered by climbing taut netting and entering through a trap door. Descending requires sliding down two structural-columns-turned-fire-poles. "Finally I told her, ‘You’re going be too old for this,’" Davis says. Deciding to work with what wasn’t available, she chose to design something entirely new from the ground up. 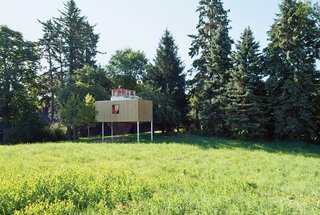 The result, a small, steel structure with cedar siding, embodies all the important aspects of a tree house, without actually being in a tree. Davis strived to preserve the sense of adventure by elevating the two-level structure. 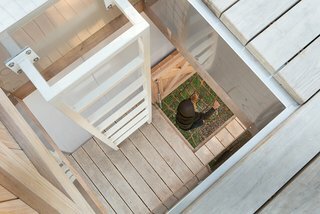 Separated from the first level by a set of trap doors, the second level holds a fold-down desk and stool, and opens up toward views of the Hudson River Valley. Davis worked with contractor Ted Timmer to construct the playhouse on her family’s 30-acre property. Wanting to make sure that children could play in it on their own, Davis designed the interactive space with safety considerations in mind. "It’s surrounded underneath by a deep bed of wood chips, and there is a railing around all of the openings," Davis explains. "One of our biggest concerns was making sure the trap doors were on pressurized hinges, to make sure they don’t close on small fingers." 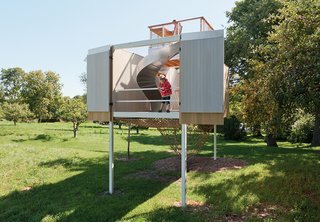 John Milich fabricated the slide in the freestanding treehouse. The polycarbonate interior is bounded by an exterior band of reclaimed white-cedar siding, open to the sky.